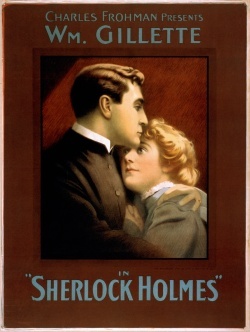 Sherlock Holmes: The Strange Case of Miss Faulkner is an American play in 4 acts, produced by Charles Frohman, written by Arthur Conan Doyle and William Gillette, performed for the first time on 12 june 1899 at the Duke of York Theatre (London, UK), on 23 october 1899 in Buffalo (NY, USA) and on 6 november 1899 in Broadway, New York (NY, USA). 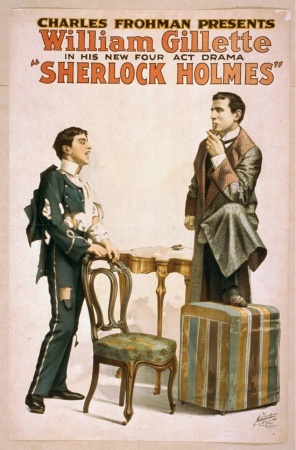 Though the play was written at first by Arthur Conan Doyle in 1897, William Gillette re-wrote it so much that the story is very different than the original one. 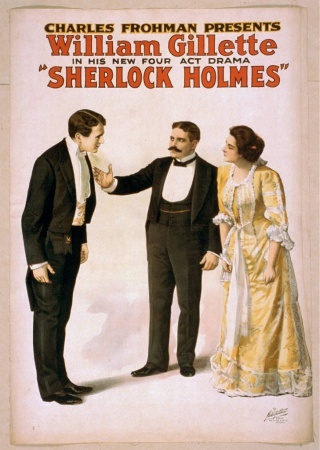 Note that the very first performance given at the Duke of York's Theatre (London), for copyright purposes, in presence of an audience comprising three persons only : Charles Frohman, William Gillette and Annie Russell. 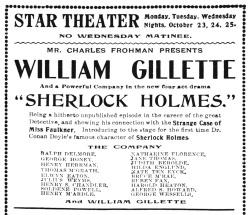 So William Gillette was not the first one to perform Sherlock Holmes of his own play. Others actors : J. D. Beveridge, Percy Lyndall, Eugene Mayeur, John Beauchamp, Hubert Willis, Julian Cross, Keith Wakeman. Act 1 : Drawing Room at the Larrabees — Evening. Scene 1 : Professor Moriarty's Underground Office — Morning. Scene 2 : Sherlock Holmes Appartments in Baker Street — Evening. Act 3 : The Stepney Gas Chamber — Midnight. 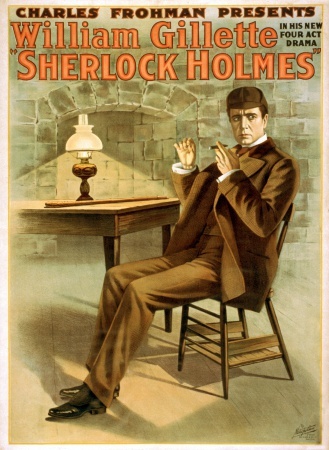 Act 4 : Doctor Watson's Consulting Room — Kensington — The Following Evening. This page was last edited on 28 January 2019, at 01:10.